Born and raised in Lacey, Rick Nelson first acquired his passion for food while bussing tables at his grandfather’s beloved local pizza parlor, Dirty Dave’s. The Timberline High School grad developed foodie traction at the Olympia Farmers Market. This was followed by stints as sous chef at Genoa’s on the Bay and at the iconic Italian hub, Mama Stortini’s. Partnering with his mother in 2003, he opened the pasta restaurant Ricardo’s. 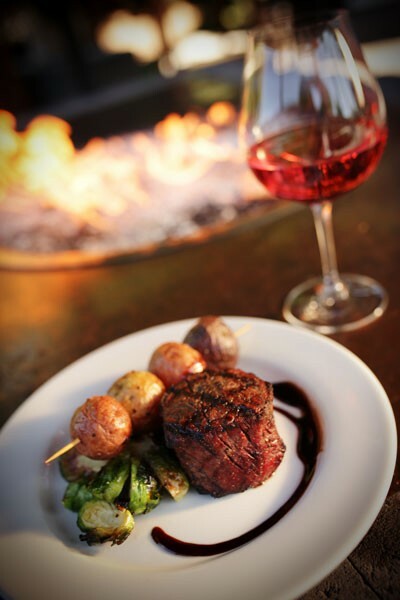 Its cozy, casual ambiance attracted a broad fan base and has progressed into one of the Puget Sound area’s most highly regarded steakhouses. For both first and longtime diners, the entire experience—from relaxing atmosphere, to edgy original tastes and top-notch ingredients, to first-rate, friendly service—is simply brilliant. Guests will find a happy hour menu from 5 to 6:30 p.m., with popular bites like Ricardo Sliders with blue cheese and tomatoes, jumbo mesquite-grilled prawns, and prime rib dips. A savvy choice of area wines and brews and specialty drinks like the ginger-infused Perfect Redhead complete the happy hour options. For dinner, the restaurant’s specialty dry-aged beef cuts plus selections such as truffle chicken, peppered ahi tuna, mesquite-grilled lamb rack on gremolata crusted polenta, and fresh, buttery breadcrumb-topped Dungeness crab mac and cheese invite culinary experimentation. Taunting desserts—gooey chocolate “Not Soufflé,” the vanilla bean-infused root beer float, tangy cheesecake, fresh wild berry crisp, and mini-bites of tiramisu, crème brûlée, chocolates and sorbets—live up to all expectations. And portions are ample enough for sharing. This fall the restaurant will be expanding to a new location to meet the needs of its ever-growing fan base in the South Sound. Meat lovers need only make reservations to experience Ricardo’s themselves.